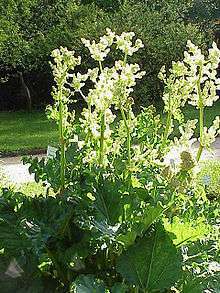 Rheum officinale, the Chinese rhubarb or Tibetan rhubarb, is a rhubarb from the family Polygonaceae native to China. Rheum officinale is used in traditional Chinese medicine, where it is called yào yòng dà huáng (Chinese: 药用大黄), and is also a component in the North American herbal remedy called Essiac tea. In modern medicine, R. officinale has been studied for the treatment of hepatitis B. However, a meta-analysis of published clinical trials concluded that the quality of existing studies was "poor", but further study of R. officinale in combination with interferon is "justified". ↑ "Rheum officinale". Natural Resources Conservation Service PLANTS Database. USDA. Retrieved 20 October 2015. ↑ McCulloch, M; Broffman, M; Gao, J; Colford Jr, JM (2002). "Chinese Herbal Medicine and Interferon in the Treatment of Chronic Hepatitis B: A Meta-Analysis of Randomized, Controlled Trials". American Journal of Public Health. 92 (10): 1619–28. doi:10.2105/AJPH.92.10.1619. PMC 1447297 . PMID 12356611.